I was reading the Bible the other day and I came across Acts 4:32-35 which spoke of how the disciples encouraged people to sell their properties and the proceeds shared amongst the needy. One of such people was Joseph who sold a property and gave the money to the disciples. I just couldn't believe that this isn't taught in our churches today. The idea was very simple at it's core but it's exactly what Christianity is all about. We are told to do to others as we would want done to us. This means putting yourself in the shoes of the needy and ask what would you have wanted a rich person to do for you, and then you do it for them. If we are truly Christ-followers, this practice should be embedded in our DNA. The church should never have a member lacking in one area or another. The verse also said that, no one lacked anything after they finished sharing. 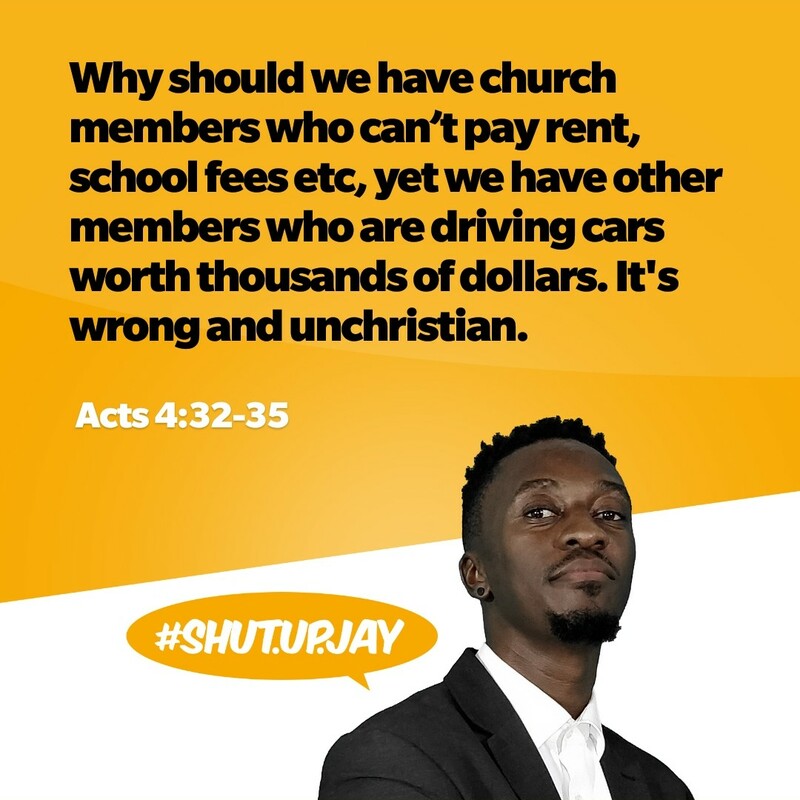 Today, you have church members with several cars, millions in their bank account, several houses, own several businesses etc and in that same church you members who can't afford 3 course meals, who live under poor conditions, are unemployed, can't pay rent, school fees, etc. This is totally wrong and I don't think Heaven will be like this so why are we allowing this to happen in God's House? Firstly, we don't need so much money or properties. If you sell 3 out of your 4 cars and the money given to pay a members school fees, or if you give 50% of all your money so that a member can afford to build his own house and others can eat well, you surely won't die. Secondly, the distribution isn't done EQUALLY. It is done based on your needs. So if your need is school fees, the value is given to you. If your need is a house, the value is given to you. So it's not about creating equality. Thirdly, at some point we all will need some help. Isn't it good to know that you have a family who are ready to help you when the need arises? When we do this, there won't be any member of the church that lacks anything. We want to see growth in the church, but we are only focusing on our spiritual growth, forgetting that there's a physical growth as well! After all the fasting and praying, we also have to eat, sleep, work etc. The church is suppose to meet these need as well and we have the answer right here in the Bible. I know people will say, if you have a need, why don't you just talk to the pastor and they will help out. But how often can you talk to the pastor for them to help out? Note that, the verse said, and they lacked nothing afterwards! No one pastor can fulfill this task, it takes a collective effort, it takes the whole church coming together and helping periodically for every need to be met. And for that, you need an organized system in place. Once you become born again, the church becomes your family FIRST before any external family. This family, however big or small should take care of your needs. It's one of the reasons people followed Jesus around, cuz He was doing good not just healing. If we want to win the world, we need to help our own. If you have 2, give 1 to your brother. The Bible said to do good to those in the household first before we go out there. It is only by so doing can we change this world for the better.